We are blessed with a really great team, like a family we are. Look at them all, aren’t they lovely? Duties: Amongst many other things – ensuring the smooth running of the factory and all production processes, designing, fabricating and installing standard and bespoke ironworks. Ensuring consistent quality of all goods leaving the production line. What he gets up to outside of work: A qualified PADI diver, keen cook and dinner party host, curry enthusiast, reliving his youth on the Yamaha RD250 he has restored to mint condition, hands on and fun dad to his two daughters. Duties: Calculating and submitting customer quotations and tenders, advising customers on technical issues, designing bespoke patterns to customer requirements. 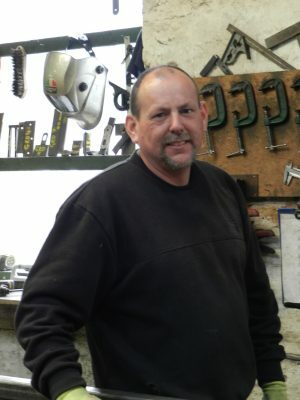 Being very helpful to customers, he can sort out almost any issue with ironworks as he has donkey’s years of hands on experience with both manufacturing and installation. What he gets up to outside of work: An overly keen fly fisherman, legend has it that he has ambitions to fish every river in the UK. He is now sporting a fisherman’s beard. Loves cooking, swimming, and also shares his brother Paul’s passion for curry washed down with a chilled Cobra. Western Highlands is his spiritual home. An Aston Villa fan. Enough said. Duties: Being lovely. 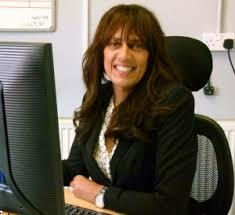 She’s very helpful to our customers, answering enquiries, sending out quotations, taking and processing orders. She’s also our Health & Safety lady. Experience: Zara joined us in March 2014 as an apprentice and she was so lovely we decided to keep her. She has trained our now not so new girl Regan and they make a lovely team. What she gets up to outside of work: She’s got a really creative side to her and she loves all things arty and crafty, eating out and chilling with her friends. She’s also a keen blogger. Duties: Dealing with customer enquiries, sending out quotations, taking and processing orders, organising order despatches. Regan is lovely with our customers. Experience: Regan joined us in July 2017 as an apprentice. She fitted in immediately and her strong work ethic has made her a real asset to the team. And so, we decided to keep her. What she gets up to outside of work: Regan loves to socialise with her lovely boyfriend and close circle of friends. She and her dad are big animal lovers and between them they have a staggering eight pets comprising two frogs, a leopard gecko, three snakes and a rescue dog. Well done Regan. Duties: Pauline does our marketing, business development, continuous improvement, website design and maintenance, slaying dragons to bring the family business into the 21st Century, making tea and coffee. Experience: Always wanted to be a Tiller Girl but studied Marketing, Procurement, Business Strategy, Change Management, and Leadership instead. Decades of experience elsewhere at senior management level in Change Management, Procurement to name a few. What she gets up to outside of work: Loves interior and garden design, learning to make soft furnishings, an avid animal lover and supporter of animal welfare improvement. Duties: Ensuring company books and all things fiscal are up to date and reportable to company accountants. Making banana loaf and drinking coffee. We were lucky to find Lisa, she’s a lovely friendly lady who completes our team. 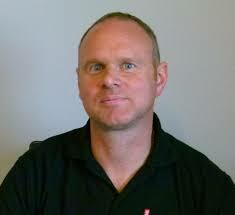 Experience: Donkeys years experience of balancing company books using accountancy software. A dab hand at bringing ancient companies into the 21st Century as she did with us. 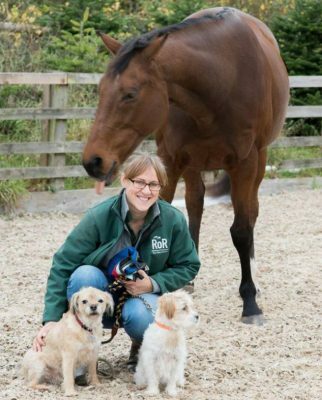 What she gets up to outside of work: Seen here with some of her pets, Rocky the horse upon which she can do all manner of glamorous equine sports such as dressage. And not forgetting Archie and Mitzi in the foreground. A proper country girl is Lisa, she makes her own jams and chutneys. We love Christmas with Lisa because she brings us things like her super home made Sloe Gin. Duties: Manufacturing our ever popular tin baths, coal bunkers and corn/storage bins. Experience: Over 35 years, he started here on leaving school and has never managed to escape. Steve is thought to be the only person left in the country who can make tin baths like ours. He’s so fast at the workbench, he can turn out a coal bunker from scratch in under 30 minutes. Our smiley chap Ricky James (see below) will take over from Steve when he retires but we don’t plan to release Steve for at least the next 135 years. Good at buying cakes and biscuits for the office ladies. What he gets up to outside of work: An avid golfer, he’ll play in all weathers because he just doesn’t feel the cold. New dad to a lovely German Shepherd pup. Duties: Andy is always smiling, we think we must have written this into his job description. He fitted in with our family straight away and it’s almost like he’s been here longer than the directors, he loves it. 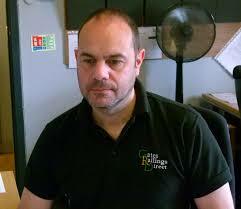 Experience: Years of experience, too numerous to mention, fabricating and installing ironworks. What he gets up to outside of work: Andy has a lovely super tasty Yamaha R1 which he enjoys polishing and blasting around on. He’s a sight to behold on it. Duties: Lee works hard in our spray shop, painting ironworks with primer/undercoat so they have an excellent base over which the customer can paint their own topcoat. 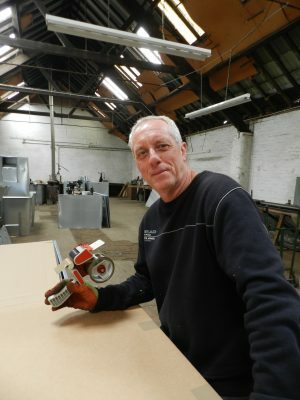 Lee is also a dab hand at welding, he prepares sheet metal components for our coal bunkers, and he packs our ironworks for despatch to customers. Experience: Lee has had many years experience in various different roles and following redundancy he joined our team in 2015. He loves it here does our Lee and he’s settled into the family with ease. What he gets up to outside of work: A keen cyclist – he does the proper stuff like going over mountainous terrain. He also likes the gym (you can tell by those biceps) and to top it all he’s got golden vocal chords and isn’t afraid to take to the stage during Karaoke nights. Duties: Making our coal bunkers and corn bins, cutting sheet metal parts for these products, helping Steve with tin bath manufacturing and spray painting our ironworks. Good at buying cakes and biscuits for the office ladies, his fiancée makes a very mean cookie which we don’t see enough of (hint hint). And did you ever see a smilier face than his? Experience: Around seven years in this business and currently learning how to make our handmade tin baths, a skilled and complicated job. What he gets up to outside of work: Our smiley chap Ricky embarked on a major purchase of jewels beyond belief, an engagement ring for his fiancée. Since recovering from that expense he’s expanded his family by welcoming his son into the world. He’s champion at growing different types of beard and is a dab hand at DIY. 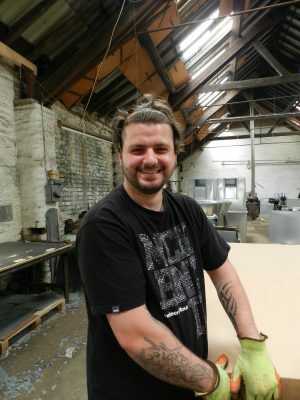 A committed family man, Ricky is kept busy with his home life and socialising with friends. 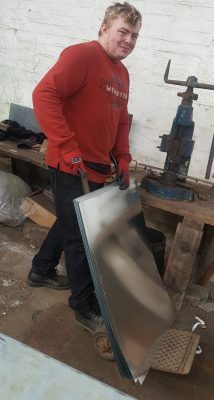 Duties: Liam carries out general factory duties including bending, folding, punching and notching the galvanized sheet steel ready for fabricating into coal bunkers and tin baths etc. He also cleans the hot dip galvanized gates and railings in readiness for powder coating. Experience: This is Liam’s first job since leaving college and he’s been great, so we’re more than happy to keep him. What he gets up to outside of work: Socialising with friends and a keen Play Station gamer. Liam has a beautiful Malamout which he enjoys taking for walks.